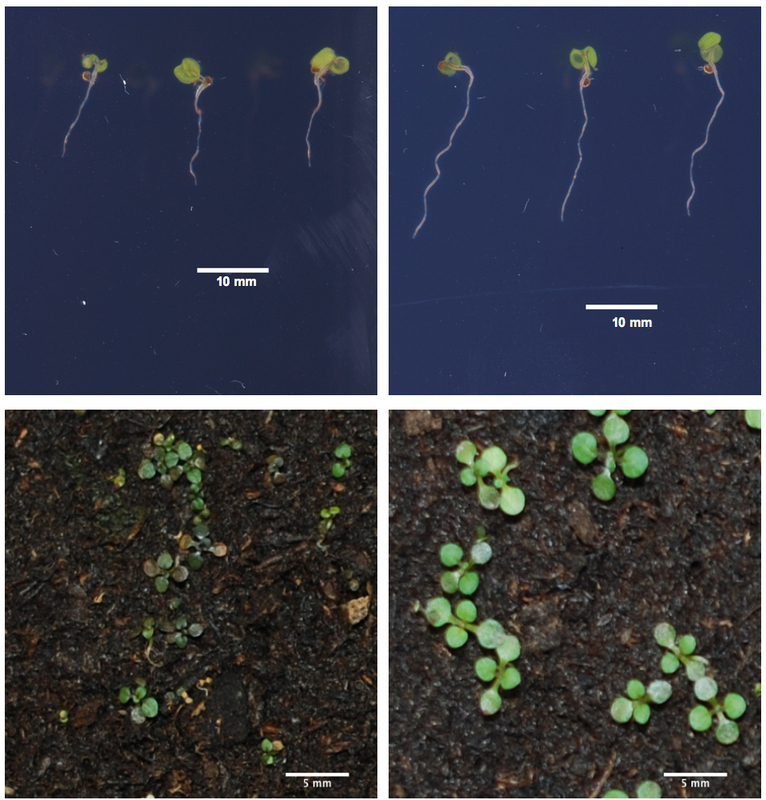 Seedlings (bottom) and roots (top) of Arabidopsis thaliana plants reveal that one variant of the FRO2 gene (right) is better for growth in low-iron conditions than the other FRO2 variant (left). LA JOLLA—Just like people, plants need iron to grow and stay healthy. But some plants are better at getting this essential nutrient from the soil than others. 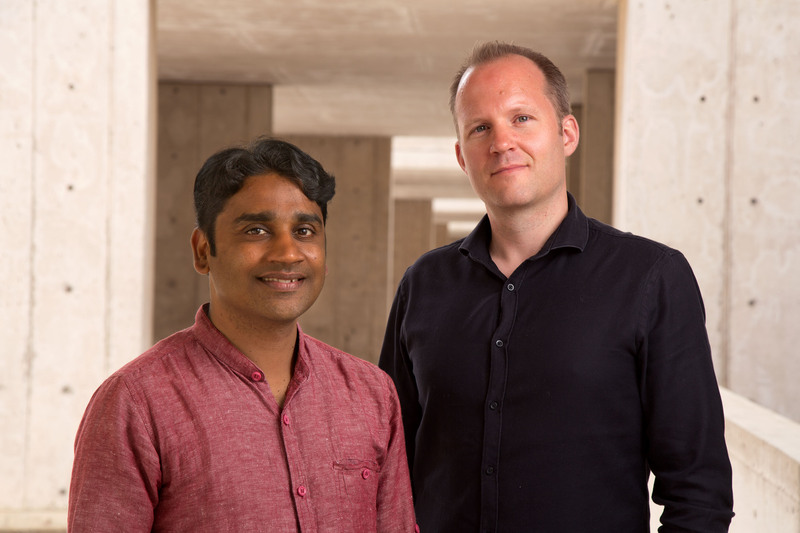 Now, a study led by a researcher at the Salk Institute has found that variants of a single gene can largely determine a plant’s ability to thrive in environments where iron is scarce. The work, which appears in Nature Communications on May 24, 2017, could lead to improved crop yields for farmers and richer dietary sources of iron for animals and humans. 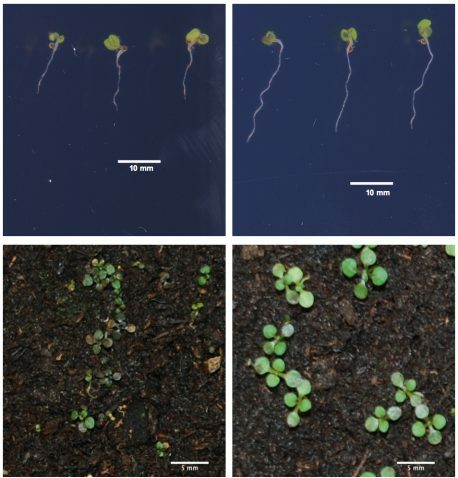 The current work, led by Busch and including researchers from Austria’s Gregor Mendel Institute of Molecular Plant Biology (where Busch was formerly based) focused on the well-studied weed Arabidopsis thaliana, a relative of cabbage and mustard. They obtained Arabidopsis seeds from strains that naturally occur all over Sweden, which has a variety of soils including some that are very low in iron. The team was particularly interested in strains that have adapted to low-iron soils and can grow a long root (a marker of health) even in those poor conditions. The researchers grew the seeds in low-iron conditions, measuring their root growth along the way. They then employed a cutting-edge method called a Genome Wide Association Study (GWAS), which associates genes with a trait of interest—in this case root length. A gene called FRO2 stood out as having a strong connection to root length. Different versions of the FRO2 gene (“variants”) fell into two groups, those that were associated with a short root and those that were associated with a long root. The FRO2 gene is common to all plants, so boosting its expression in food crops or finding variants that thrive in poor soils could be important for increasing crop yields in the face of population growth and global warming’s threats to arable land. “At least two billion people worldwide currently suffer from iron malnutrition. Anything we can do to improve the iron content of plants will help a lot of people,” adds Busch. Other authors included Claudia Setzer, Florentina Freynschlag, Radka Slovak and Envel Kerdaffrec of the Gregor Mendel Institute. The work was funded by the Austrian Academy of Sciences through the Gregor Mendel Institute (GMI) and an Austrian Science Fund (FWF) stand-alone project (P27163-B22). Santosh B. Satbhai, Claudia Setzer, Florentina Freynschlag, Radka Slovak, Envel Kerdaffrec and Wolfgang Busch.